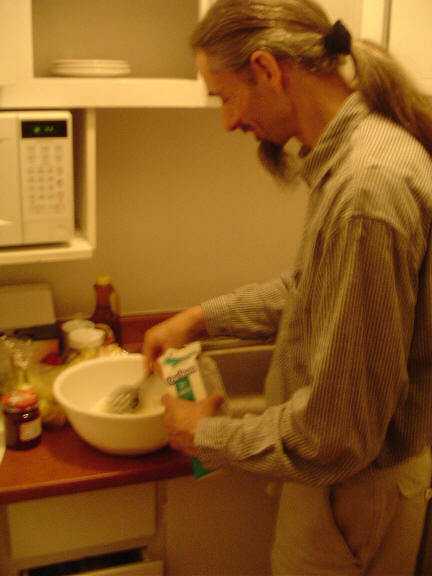 My friend Olivier came over the other night to show me how to make French crepes. He’s from France, speaks French (better than me) and knows how to say all those cool things like Bon Jour and Si Vouz Plais. Did I spell that right? Hey, how the heck do I know. That’s why he has to show me how to make French crepes the authentic way. HEY GUYS! I’ve only been cooking for a week now and I was able to make these by myself tonight. It was pretty easy and they taste awesome. 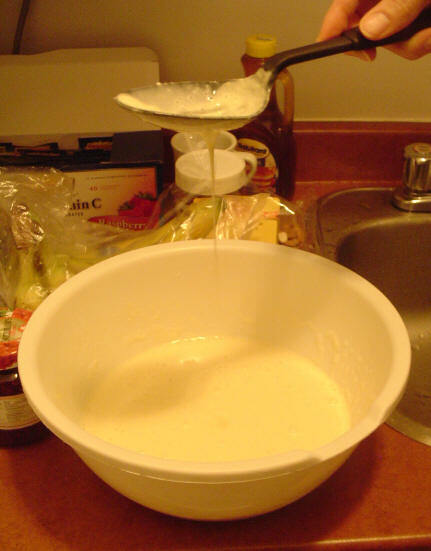 So here’s how to make “Olivier’s Super Duper French Crepes”. (Remind me to get a cut on the trademark).Â Olivier eats them and he’s pretty skinny – so eat as many as you want. I had about 10 crepes tonight. I will probably be as skinny as Olivier pretty soon now. Rule #1 – We’re guys, we don’t need no stinkin’ measuring cups. Just throw stuff in. 2. 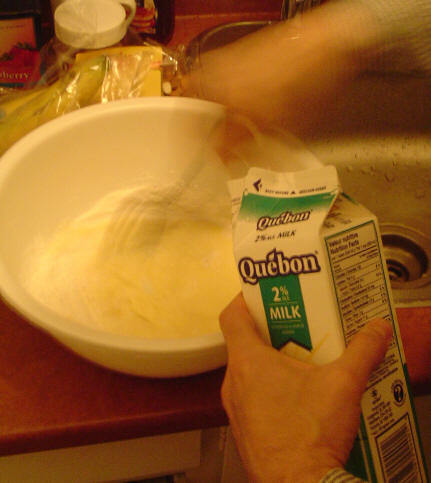 Add milk until the consistency is like cream you’d use in your coffee. You might use about a half liter or more. 3. Did I remember to tell you to add a double pinch of salt and a little butter? Or was it just salt? Just throw it in. You like butter don’t you? OK, just do it. 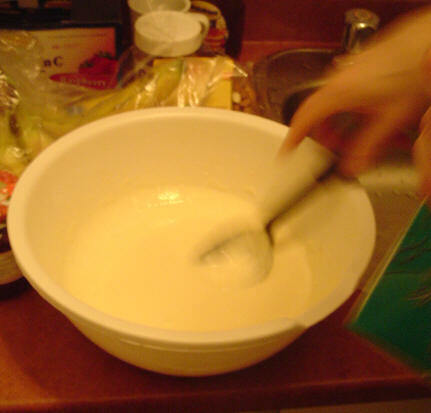 OPTIONAL: Let the batter sit for one to two hours. 4. 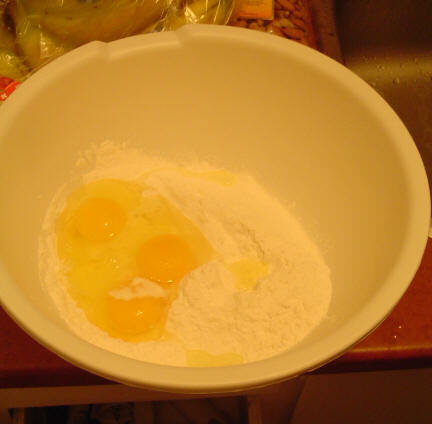 Everything should be mixed, now put just enough in the pan to cover the bottom. Olivier turns the pan a bit as he puts in the crepe batter so it will spread around. Now I’m lazy and I just glop a bunch in the cover it easy, but my crepes come out more like pancakes. 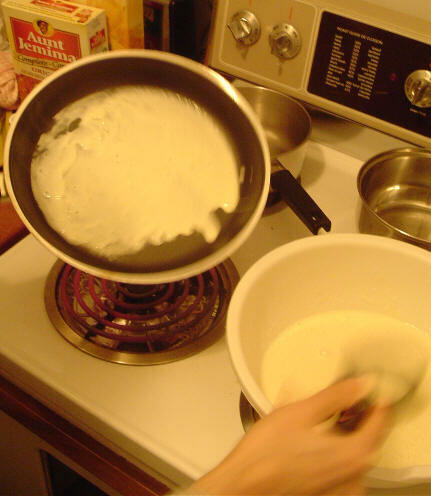 The trick to crepes is that they are thin – so just enough to cover the pan and rotate it to let gravity help you out. 5. 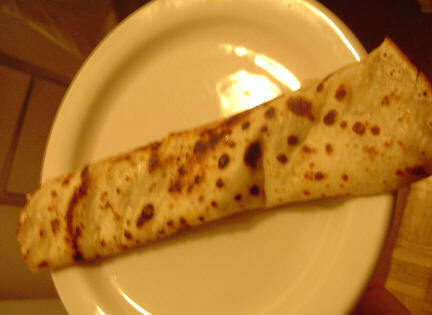 You can turn the crepe over when the edges turn a bit brown. I like my crepes a little mushier (more like Swedish pancakes) so I turn them a little sooner. A. Nothing – but added pure maple syrup when finished. B. 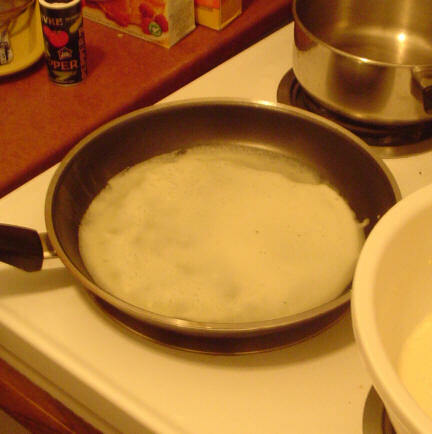 One Egg with Salt – crack the egg right on top of the half cooked crepe and mix it around the top. Yes, it will cook fine and continue cooking once rolled up. Add some salt! That’s what Olivier does. C. Cheese – I also tried the egg with chicken, cheese and sour cream. 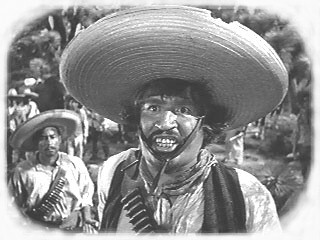 It was great, but I did get the feeling I was not making Mexican food instead of French. D. Crepes Suzette! – Squeeze half a lemon over the back and add some sugar. Now I’m going to warn you about the dark side of making crepes. While making them I noticed that the time it took to cook the first side of the crepe was the exact amount of time it takes me to eat the last crepe I just made. So I went on a crepe making binge and now I have a tummy ache. Maybe you should invite people over so you don’t eat them all yourself. Another tip – Olivier prefers butter over margarine. I tried both and I’d have to say he’s right – use real butter. Extra Secret Bonus Tip – Olivier had authentic Canadian maple syrup, and I just used regular pancake syrup. BIG difference – get the top shelf syrup if you’re going to eat them that way. EXTRA EXTRA BONUS TIP – If you’re going to do a crepe binge like me, start with the salty ones first (chicken, egg, etc.) and then move on to the sweeter ones. A progressive crepe bonanza. Chicken Stir Fry. More easy recipes that even Norwegian guys can be smart enough to make. Takes under ten minutes and super yummy. 1. Prepare rice. 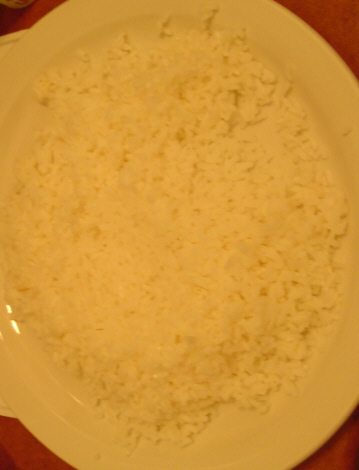 Put equal parts water and rice in a pan with a little butter and salt. Once water begins to boil remove from heat and cover. Let it sit while you make the rest. 2. 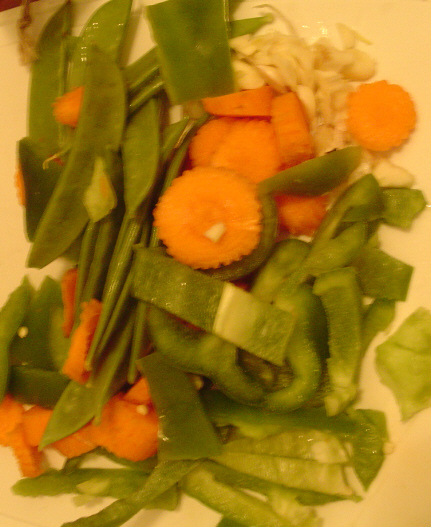 Cut vegetables. Any vegetables you like. 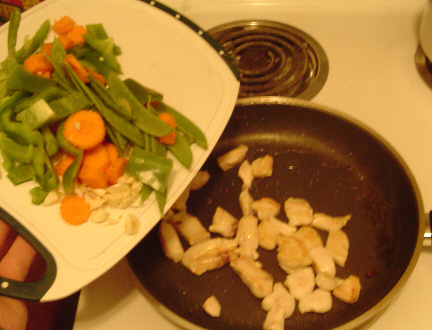 I used beans in the pod, green peppers, a couple clovers of garlic and diced carrots. 3. Warm pan with oil or butter and start cooking your diced chicken. When you flip the chicken pieces over, then start adding your vegetables. Add soy sauce, salt and pepper to taste. 4. Take your finished rice and put it on the place. 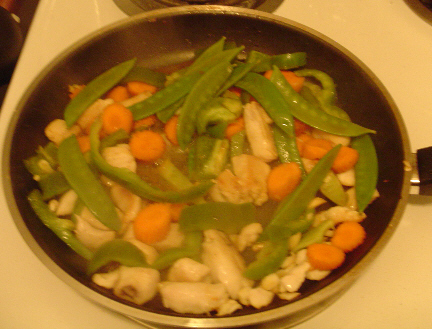 Finish mixing the vegetables and chicken and put on top of the rice. 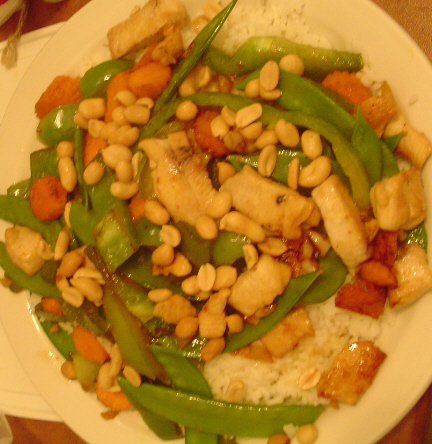 Top with soy sauce and nuts of choice. I used peanuts and it was AWESOME. This meal was so good I couldn’t believe it was healthy. Maybe I’ll find out it wasn’t, but itÂ LOOKED healthy and tasted as good as any junk food. Guaranteed to make guys happy, even dense Scandinavians who don’t know how to cook. 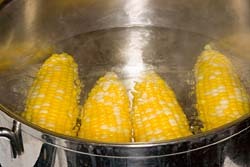 1) Put corn in kettle of water and boil 1-10 minutes. The longer you boil, the softer it is. I boiled my corn for two minutes and then let it sit. Put butter on it and it tasted good to me. What guy doesn’t love that simple recipe? That’s it. Chow down. Or read on for a more exquisite approach. 1. Fill a large stock pot (about an 8-quart) half full with water. 4. 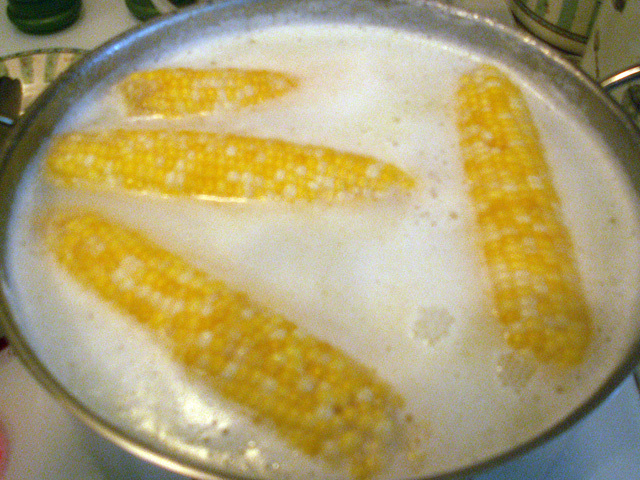 Reduce heat to a simmer and allow corn to cook for 8-12 minutes or until tender, depending on size of corn try not to over cook the corn as it will become tough.